Hey, that rhymes. 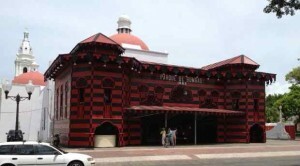 Ponce, pronounced “pon-say”, is the second largest city in Puerto Rico. 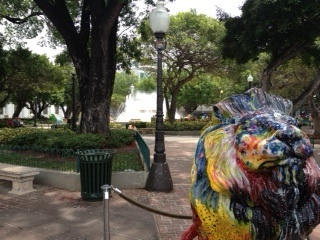 It is named after Juan Ponce de León y Loayza, and thus the city emblem is the lion. 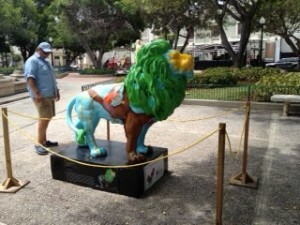 There are lots of lion statues about the place. My favourites are the newest ones. We saw them dotted around the historic city square. Chicago has its cows; San Francisco, its hearts; Vancouver, its orcas. 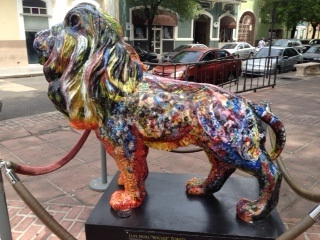 Ponce has its lions. A side view of the prettiest lion. Next priority was finding the Coto Laurel post office. We (big thanks to Gayle who found and sweet-talked PR’s best post office employee — seriously) had arranged for mail and packages to be sent “general delivery” to the Coto Laurel post office outside of Ponce. I didn’t know that general delivery still existed. One of our packages had arrived. I hope the others will arrive on Monday. One of the items in Saturday's package was a new watch for Jane. I'd lost my old one somewhere on the boat. I was sure it was on the boat, but when it didn't turn up after a couple of weeks, I ordered a new one. The very day that the new one arrived, Paul found the old one. Now I have a spare. 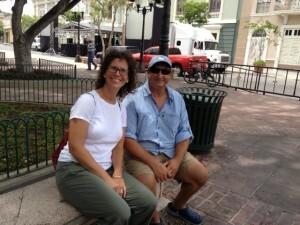 We did a noon time stroll around the old colonial center of the town. Some nice old buildings and some that are in disrepair and some vacant lots and some new infill. Not much was open at 11:45 am on a Saturday in low season. Happily, the famous King’s ice cream shop was open. P & G chose chocolate, and T & I enjoyed the tamarind. 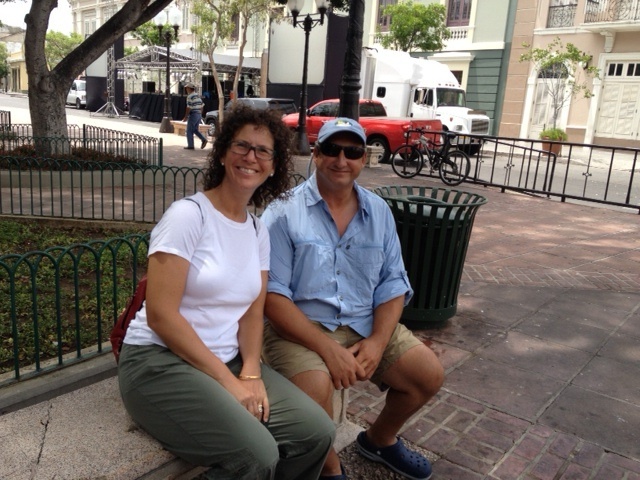 Pete and Gayle in the plaza / town square where we enjoyed ice cream (before noon -- scandalous!). 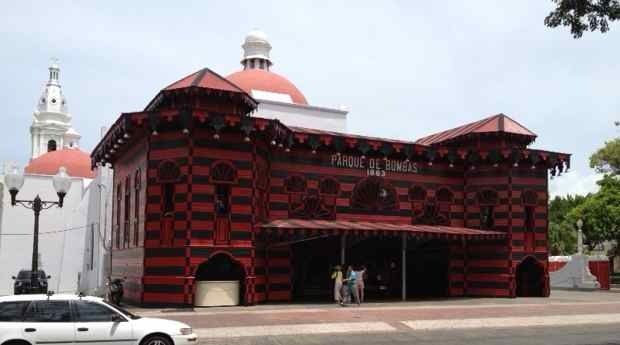 Also in this town square is the fascinating Parque de Bombas building — built for an Exhibition Trade Fair and used as a fire station after that. It is now a museum. We completely failed to find the first hardware store recommended in “crazy man’s guidebook”. I think the store had closed. 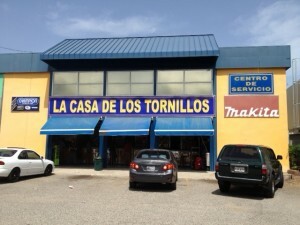 But, we did, eventually, find the House of Screws or rather La Casa de los Tournillos. We took a number and queued for a long time and it was hot, but in the end it was worthwhile — a successful shopping outcome. If you ever find yourself in Ponce looking for obscure screws, we recommend this place. 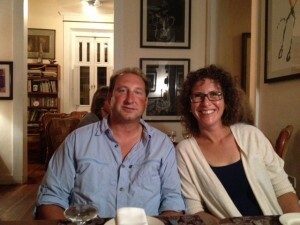 In the evening, after more shopping and shlepping and stowing followed by a little primping, we met Paul in town for a lovely meal at Isabel 46, a restaurant in an historic house in the centre. This was going to be a nice picture of Pete and Gayle at the restaurant... then suddenly Pete noticed some badly matched crown molding on the (high) ceiling. btw SPAF Properties would never do such a sloppy match. 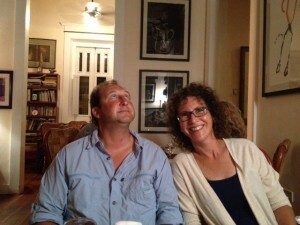 Take II: Better, but I suspect he's still thinking about that crown molding. This entry was posted in Caribbean Islands by Jane. Bookmark the permalink. I’ve only seen Tony in funny outfits so can’t really picture it. Sounds like you guys are having a blast and the weather’s been good to you. No hurricanes in sight I trust. 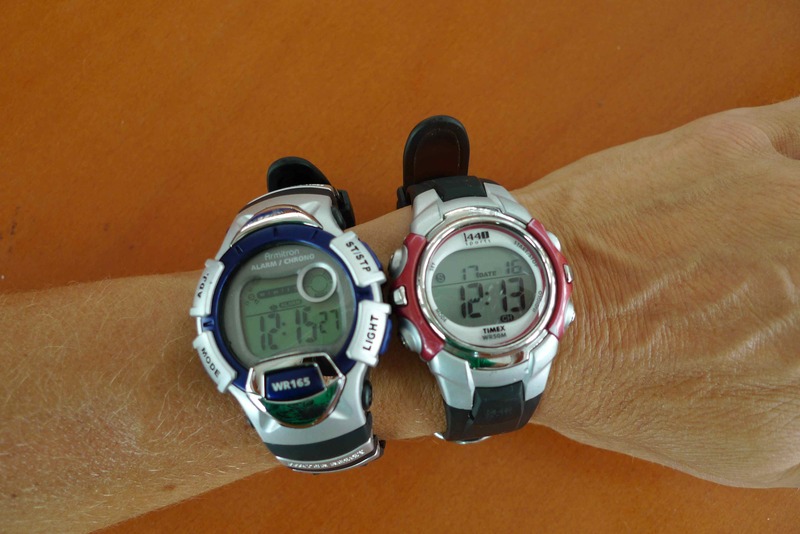 Jane, can you please synchronize your watches. All kidding aside-Great post. I do feel like I’m there. I thought someone would notice that. I didn’t notice until I put the picture into the blog.